How CPR CAN Save a Life? If you are trained to do CPR then there is no doubt in it that you can do something, obviously CPR, to save lives. In our today’s post we will see what steps we do perform to complete exercise which is called CPR. What does it mean? and How it is performed on an infant, children and young adult. CPR is abbreviation of Cardio-Pulmonary Resuscitation. CPR is also known as artificial/external chest compression. CPR is performed when heart stops pumping blood caused by severe medical problems. First Aid to Save a Life (FATSAL) Pakistan is unfortunate and can’t present any sort of proven data/record to show fatalities caused by heart from Pakistan. We have interviewed many doctors (who voluntarily answered our questions) to help us understand their reporting system after declaring any expiry in their hospital and discussed deficiencies in reporting and collection system. But we can quote here the statistics mentioned by Punjab Institute of Cardiology (PIC) Lahore representatives who said that Sudden Cardiac Arrest causes more than 140,000 deaths every year in Pakistan. Sudden Cardiac Arrest (SCA) causes the heart’s normal rhythm to suddenly become chaotic. The heart can no longer pump the blood effectively and the victim collapses, stops breathing, becomes unresponsive, and has no detectable pulse. SCA can strike anyone, anytime & anywhere and take a precious life away. 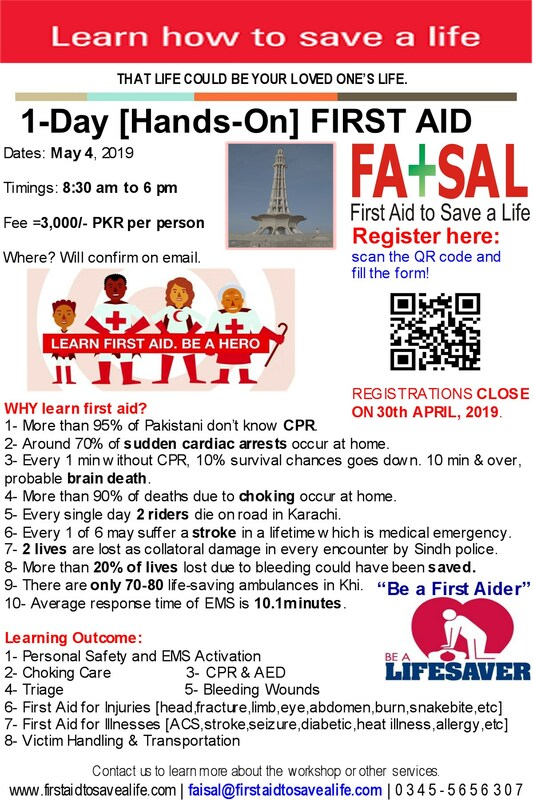 Let me tell you in steps about CPR, sudden cardiac arrest and how First Aid to Save a Life Pakistan can help you to fight this and save lives. We all are interested to know what to do next to save live. It will only take our 10 to 20 minutes workout and wisely initiating emergency management services (EMS), like 1122 or other known services in each area to deal with medical emergencies, to do the rest for us. if you found someone unconscious? If YES, then you are a GREAT PERSON, A HERO, and I have no words to praise you. AND if you don’t know how to save a unconscious patient’s life then learn it today and BE A HERO. This entry was posted in CPR and AED, First Aid and CPR, First Aid CPR and AED, First aid for Families. Bookmark the permalink. 15 Responses to How CPR CAN Save a Life?